UPDATED: Democrat Celia Israel defeated Republican Mike VanDeWalle on Tuesday in a special election runoff for House District 50. She will serve the remainder of former state Rep. Mark Strama's term. Democrat Celia Israel will be the next representative for House District 50 after winning a special election runoff Tuesday over Republican Mike VanDeWalle. With all precincts reporting, Israel received 59 percent of the vote in HD-50, which includes North Austin and part of Pflugerville. Mike VanDeWalle, her opponent, received 41 percent, according to the Travis County clerk's office. "This race is a sign of where Texans are headed," Israel said Tuesday. She will succeed former state Rep. Mark Strama, D-Austin, who vacated the seat last year when he took a job with Google Fiber. She will serve the remainder of Strama's term before facing re-election in November. Both Israel and VanDeWalle have filed to run again. Israel, a lesbian, will join state Rep. Mary González, D-Clint, as state legislators who identify as LGBT. Her campaign received support from organizers with Battleground Texas, a group focused on registering more Democratic voters and turning them out for the party’s candidates. In a statement, Battleground Texas called Israel's victory the "first of many to come." The election results reflect ballots cast during early voting last week and between 7 a.m. and 7 p.m. Tuesday. They do not include provisional ballots cast Tuesday evening between 7 and 8 p.m. Election officials approved an hourlong extension at polling sites after Tuesday morning's inclement weather in Central Texas forced several area school districts to close. Early voting in the district was saw a paltry 4.5 percent turnout. And icy weather on election day prompted closures of eight of the district's 36 polling places. While turnout was low Tuesday morning, it picked up later in the day, a representative for the Travis County clerk's office said. The runoff ultimately had an 11 percent turnout. It followed a November special election in which VanDeWalle took first place, with 39 percent of the vote, and Israel took second, with 32 percent, ahead of two other Democrats. For voters in North Austin and part of Pflugerville, it’s election day. Again. But freezing temperatures could keep many voters at home during the special election runoff for House District 50. That makes the contest, the state's first legislative election this year, all the more heated. 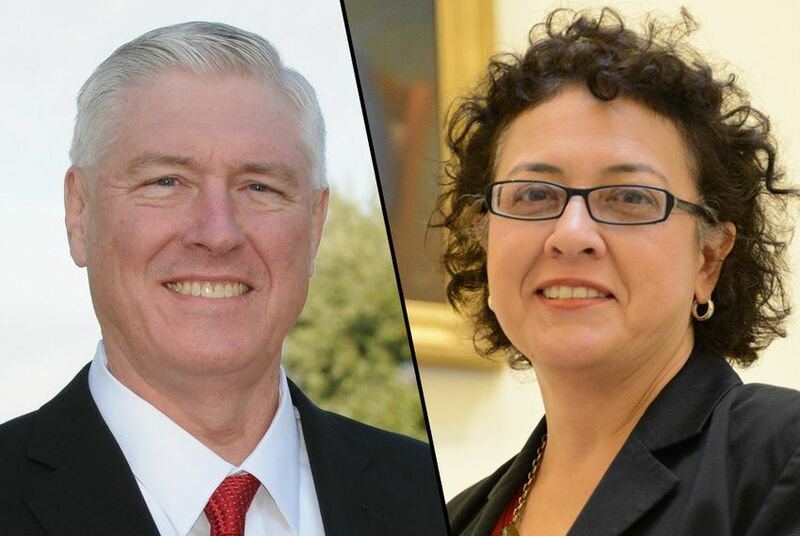 Democrat Celia Israel and Republican Mike VanDeWalle face off Tuesday in a runoff for the seat vacated by Democrat Mark Strama. The winner will serve the remainder of Strama's term before a rematch in November. Polls are scheduled to be open from 7 a.m. to 7 p.m.
VanDeWalle, the lone Republican in the special election, finished first in a four-way race in November with 39 percent of the vote. Israel placed second with 32 percent, emerging as the top Democratic candidate of three. Political observers have keenly watched the race for Strama’s seat, which he left last year to take a job with Google Fiber. Republicans see VanDeWalle’s candidacy as an opportunity to turn a blue seat red, while Democratic groups like Battleground Texas have backed Israel as part of a statewide effort to grow their base. Turnout during early voting was extraordinarily low. Just 4.5 percent of eligible voters cast early ballots in the election — about half as many as in the last special election runoff in Travis County, according to the county clerk’s office. Supporters of both campaigns have acknowledged the awkward timing of both early voting and election day. Early voting began last Tuesday, one day after the Martin Luther King Jr. holiday, and ended Friday, when polls opened five hours late because of icy weather. Meteorologists predict icy conditions with a low of 25 degrees in Austin on Tuesday, which could lead to further voting delays. Israel, who got her political start working for former Gov. Ann Richards, said her focus on funding public education resonated with voters in the district, 61 percent of whom cast their ballots for a Democrat in the first special election. The challenge, she said, was not persuading voters, but getting them to the polls. “Support for public education, that’s the No. 1 issue at the door,” Israel said. “We feel like we’ve got the more energized campaign." Low voter turnout makes the race’s outcome more difficult to predict, both Republicans and Democrats said. For both candidates, Tuesday’s special election is a preface to a larger showdown in November. Each has filed to run again for a full term in 2014, in what is likely to be a higher-profile contest. But Tuesday’s winner will have the advantage of incumbency. “It’s going to really depend on turnout,” Edwards said.